Protozoans are unicellular eukaryotes with either plant- or animal-like characteristics. Through careful observation, we analyzed various protozoan cultures in order to identify characteristics associated with cell structure and movement of these one-celled organisms. We found that Protists exhibit certain characteristics that allow them to be categorized into different groups, mainly determined by their locomotion patterns. Despite differences in locomotion and the varying plant-like and animal-like organelles, all protists share key characteristics and functions that allow them to feed, grow, and reproduce--processes essential for survival and common to complex organisms. Unicellular eukaryotes belong to the kingdom Protista, and are often referred to as “protists” or “protozoans.” The name “protozoan” means “first animal,” but eukaryotes may display either plant or animal-like characteristics, or a combination of both. Although unicellular, they have a nucleus and membrane-bound organelles, making them functionally complex despite their small size. Each small protist is a self-supporting unit, carrying out all the processes for survival in just one cell. They thrive on moisture and can be found on moist soil and in fresh and marine bodies of water. There are about 30,000 known species of protozoans, commonly classified according to their movement patterns as sarcodines—moving with false feet called pseudopodia or, flagellates—moving with whip-like structures known as flagella, ciliates—moving with short hairs known as cilia, and sporozoans—with no movement. They all have varying shapes, sizes, and survival strategies. For example, some may “hunt” small particles of food such as bacteria or algae; whereas others may be parasitic, inhabiting larger organisms. Despite their differences, all protists have several characteristics in common. In addition to a nucleus or nuclei to house their genetic material, most protists have mitochondria for metabolic functions, and vacuoles for digestion and excretion. With the help of these and other cellular structures, protists may feed, grow, and reproduce. In this lab we observed select examples of protists in order to identify their cellular structures, and determine to which group of protista they belong based on their form of movement. We also made drawings of our observations using light and dissection microscopes to practice proper microscopy skills, including making wet-mount slides and cell sizing. By observing, drawing, and classifying protista, we learned about the cell structure and movement patterns of these one-celled organisms. We also learned about the differences and similarities of various protist cells . Since we will observe how protists move, it will be interesting to figure out patterns of locomotion. For example, what happens when the protist encounters an obstacle? Does motion change when the organism is feeding? How does motion relate to where the organism lives? What characteristics do the protists exhibit: plant, animal, or both? Do the plant/animal characteristics influence motion patterns? Three protists were chosen for observation. See the list of protists below to choose three samples. For each of the protists, a pipette was used to extract a few drops of culture from the culture jar. The drops of culture were placed on a clean microscope slide and covered with a slide cover slip. Using a light microscope, each protist was examined at different magnifications until the best field of view was found for identifying cellular structures. The color, shape, and motion cellular structures was noted. Each of the protists was drawn and the drawings were labeled. Field-of-view, magnification, and cell size was noted on the drawings, along with the organism’s name and protist group. All protists that were selected had features in common, but they all moved differently. The example protists were: Euglena, Paramecium, and Amoeba. 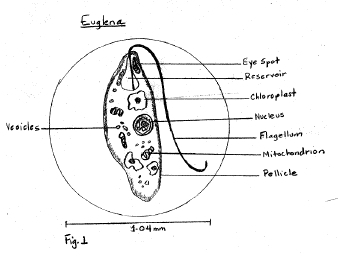 Euglena moved with a flagellum and so is classified as a flagellate (see Fig. 1). 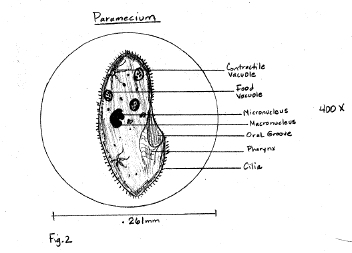 Paramecium moved with cilia and so is classified as a ciliate (see Fig. 2). Finally, Amoeba moved with a pseudopod, and so is a sarcodine (see Fig. 3). All three protists had a nucleus, as expected, but the Paramecium had two nuclei, a micronucleus and a macronucleus. The Paramecium and Amoeba both had food and contractile vacuoles, but these were lacking in the Euglena. All protists had animal-like characteristics in terms of their movements and feeding patterns. Of the three, Euglena was the only one that had chloroplasts, an organelle common in plants. Protists seem to share certain characteristics even when they are classified into different groups. Their organelles are a mixture of animal and plant structures, but they all have nuclei, a feature which distinguishes Protists from other unicellular organisms. The protists’ motion was consistent with their locomotion organ: cilia, flagella, or pseudopod. This motion was very clear under the light microscope, but interactions of protists with others in the culture jar were better observed using the dissection scope. 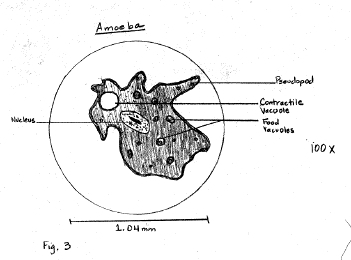 The Amoeba moves by extending part of its cell. This extruding part is the pseudopod, and allows the Amoeba to drag itself from one place to another (see Fig. 3). Its movement is slow, and changing directions is just a matter of extending a pseudopod in a new direction. Amoebas do not seem to have a particular shape, with the exception of the pseudopodia that consistently protrude from the cell. This shapeless but ever shifting quality of the Amoeba’s shape allows it to surround, engulf, and ingest its food by a process called phagocytosis. Paramecia are smaller than Amoebas. They move with the help of microscopic hair-like structures called cilia, which act like oars to push them through the water. They swim by rotating slowly and changing directions often. If the Paramecium comes upon an obstacle, it stops, swims backwards, and then angles itself forward on a slightly different course. Cilia help the Paramecium move as well as feed. When the Paramecia feed, it does so by drawing its food into a funnel-shaped opening called the oral groove that is lined with cilia (see Fig. 2). The oral groove is like a mouth, taking food in with the help of cilia, which direct and move the food inward. The Euglena moves rapidly, using its flagellum to propel itself through the water rather quickly, shifting directions with whip-like movements. Unlike the Amoeba and the Paramecium, the Euglena has plant-like characteristics. It is sometimes referred to as a “plant-like” protist. The organelle that gives it this plant-like quality is the chloroplast (see Fig. 1), a green organelle responsible for carrying out photosynthesis in plants. The Euglena senses light with a light-sensitive organelle called the “eyespot,” which directs the organism to a light source strong enough for photosynthesis to occur. Since it can undergo photosynthesis, Euglena is able to make its own food just like plants. The three protists examined in this lab are examples of protists that use specialized structures for locomotion. Although the Euglena has some “plant-like” characteristics, all protists mentioned above, exhibit animal-like movements. These protists exemplify the animal-like and motile types of protozoans. As compared to other protists, the animal-like features of the protists we observed allow them to be motile. Their motility comes in handy for moving about their environment and finding food. They may be contrasted to another class of protist, the sporozoans. Sporozoans have no form of locomotion and are primarily parasitic, ingesting their food by absorption through their cell membranes. No matter what type of locomotion a protist uses, all protists must be able to carry out the metabolic functions of multicellular organisms. Based on the observations in this lab, protists are very small yet highly complex. They have all the organelles necessary for a variety of functions such as digestion, excretion, reproduction, respiration, and movement. Protists are self-supporting “one cell factories” churning out all the processes that are usually carried out by a highly-organized network of cells. In this lab I learned about the structure and function of the smallest eukaryotic organisms, the unicellular protists. Although very tiny, these organisms are very complex, housing all the necessary life tools in one single cell. This shows that the complexity of an organism is not necessarily related to its size. I also learned to identify and classify different types of protists. I was able to observe locomotion patterns as well as other characteristic features. In doing so, I gained useful microscopy skills such as making wet mount slides, finding the proper magnification for viewing, and drawing microscope observations with all the proper labels.